[prMac.com] Permaisuri, Malaysia - Independent developer Wan Ahmad Lutfi today introduces QuartzCode 1.02, his new code generator tool for OS X. QuartzCode is a lightweight and powerful animation tool that turns vector drawing and animation into Objective C code. This allows users to export code that can be entered directly into Xcode and allows the building of applications. With QuartzCode, developers and designers create new vector drawings and animation using the tools provided or by utilizing existing assets from SVG or images. To reduce the learning curve, QuartzCode has been instilled with familiar Core Animation properties. 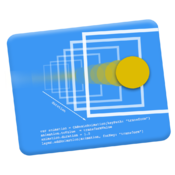 Users can create CABasicAnimation or CAKeyframeAnimation using more than 25 animation key-paths supported. Users can create a variety of shapes from the basic shape templates provided. To create more advanced shapes, QuartzCode includes vector, pencil, and boolean operations. Edits can be incorporated by using vertex and transform modes. Colors and/or gradients can also be added to the shapes. Additionally, QuartzCode features a Replicator which can create replication effects of its sublayers, including animation. QuartzCode layer hierarchies can be combinations of any layer types, which enables users to create complex layer hierarchies and animation. QuartzCode supports Core Animation and UIView block-based code generation. Core Animation is created using CALayer subclass, such as CATextLayer, CAShapeLayer, CAGradientLayer, CAReplicatorLayer and CAEmitterLayer. All code generated by QuartzCode is readable, can be modified, and is produced in real-time. Users can create particle systems in QuartzCode, such as animation of fire, explosions, and moving water. With the ability to use multiple emitter cells in an emitter layer, QuartzCode also allows each emitter cell to have its own image and properties. Another useful feature of QuartzCode is effect layer. Multiple animations can be chained and applied to effect layer's sublayers only by changing a few parameter to incorporate a delay effect. Thus, users can produce complex animation by combining different animation key-paths. In addition to delay effect, delay order can change the order of the sublayers' animation and can be a useful tool for animating text glyphs individually. "QuartCode was created to make Core Animation coding much faster and more fun!" explains independent developer Wan Ahmad Lutfi. "With QuartzCode, developers and designers can easily create complex animations without needing to write a single code. Also, iOS and OS X code is automatically generated on the fly. Creating animation simply couldn't be easier using QuartzCode!" For a limited time, QuartzCode 1.02 is only $79.99 USD (regularly priced $99) and available worldwide exclusively through the App Store in the Developer Tools category. Review copies are available upon request. Based in Permaisuri, Malaysia, Wan Ahmad Lutfi is an independent developer who creates applications for both iOS and OS X applications. His focus is to create apps that can help increase people's productivity. All Material and Software (C) Copyright 2014 Wan Ahmad Lutfi. All Rights Reserved. Apple, the Apple logo, Macintosh and Mac OS X are registered trademarks of Apple Inc. in the U.S. and/or other countries. Other trademarks and registered trademarks may be the property of their respective owners.